Patients of African descent who wish to benefit from hair transplant surgery require a more specialized approach compared to other ethnic groups. Individuals of this demographic tend to have two distinct anatomical differences that often stand in the way of successful outcomes. These include hair follicle shape and dermal skin thickness. Overcoming both challenges is absolutely necessary to achieve the best success rates for African American hair transplants. This is possible by using Dr.UGraft’s devices ( Dr.UPunch i™, and the Dr.UPunch Curl ™). These instruments represent the first set of technologies in the world which meet the surgical hair restoration needs of African American patients. Your browser does not support the video video player. Today’s hair transplant methods have come a long way in being able to produce impressively natural-looking coverage. However, conventional approaches do not offer a one-size-fits-all solution for everyone. Their shortcomings are especially clear in the case of most black patients. Strip surgery produces a permanent linear scar on the back of the head. To keep this hidden, patients often choose to wear their hair longer. However, most black men prefer to wear their hair extremely short and closely cropped. Hair transplant linear scars would easily show through such hairstyles. Since most black men prefer short, closely cropped hairstyles, strip procedures would not be the best choice for their long-term sense of satisfaction. Furthermore, many patients of African descent are genetically predisposed to developing keloidal scars. This type of scar tissue is thick, raised and often larger than the original size of the wound. According to the Henry Ford Health System, black patients are seven times more likely to form keloid scars on the head and neck. Stronger anchoring tissue attached to the follicles. Individuals of African origin have hair follicles with a unique curved shaped. By comparison, the follicles found in other ethnic groups are straighter. The extent of the hair follicle curl is described in terms of the angle of C. Due to their shape, a more curved hair follicle will be less compatible with general, straight cylindrical punches. And they will be more susceptible to damage by these instruments. Black patients tend to have thicker dermal tissue in their scalp. This makes it more difficult for a hair transplant punch to penetrate without exerting a stronger downward force. However, doing so will incur the risk of misaligning the device and damaging the grafts. To fully free the donor hair follicle grafts, practitioners have to sever the anchoring apparatus completely. However, in black patients, this connective tissue tends to be stronger and more stubborn. As practitioners apply more force to overcome this issue, they also risk endangering the grafts. Dr.UGraft ™ devices for extracting Afro-textured hair follicles makes it possible for all black patients to benefit from reliable hair transplant procedures. Now, Dr.U, the inventor of these instruments has evolved his existing technology with new features. The pairing of the intelligent Dr.UPunch i™ in-tandem with the Dr.UGraft Nurture ™ handpiece allows practitioners to deliver highly controlled drip-measured fluid to hydrate the curved shaped grafts while they are being extracted through a highly intuitive, self-navigating process. The fluid also lubricates the sharp outward facing edge of the punch which improves the longevity of the instrument. At the same time, the lubrication of the curved surface which faces the follicle reduces friction and enables a smoother ascent into the lumen of the punch. This fluid integration system contributes to bulkier, more robust grafts that have been well-protected from typical sources of mechanical surgical injuries. The Dr.UPunch Curl ™ has now been upgraded to the latest version 2.0. This new iteration of the double-pronged non-rotary punch includes smaller, sharper blades. 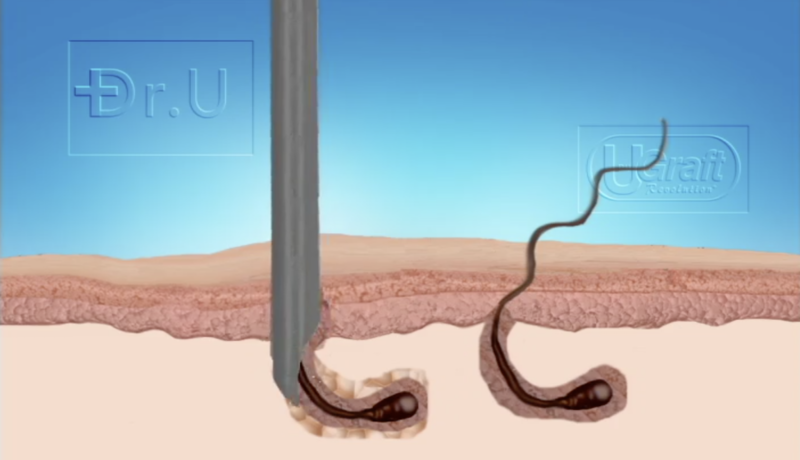 Besides accommodating the unique curvature of the follicles, the Dr.UPunch Curl ™ 2.0 offers practitioners an even more user-friendly extraction experience. The recent improvements enable easier and faster extractions for more challenging patient cases involving thicker, denser dermal attachment in the surrounding tissue. Both technologies are built to seamlessly produce whole follicular graft units without compromising the surrounding protective sheath. Their breakthrough features enable healthier grafts for successful long-term growth. They allow all patients of African descent to place their confidence and faith in the reliability of these Dr.UGraft devices without having to just hope for the very best growth results possible. And with the newest versions of this instrumentation, providers can now experience even greater ease at overcoming previous hurdles of safe graft extraction in black patients whether they present easier or more challenging cases. 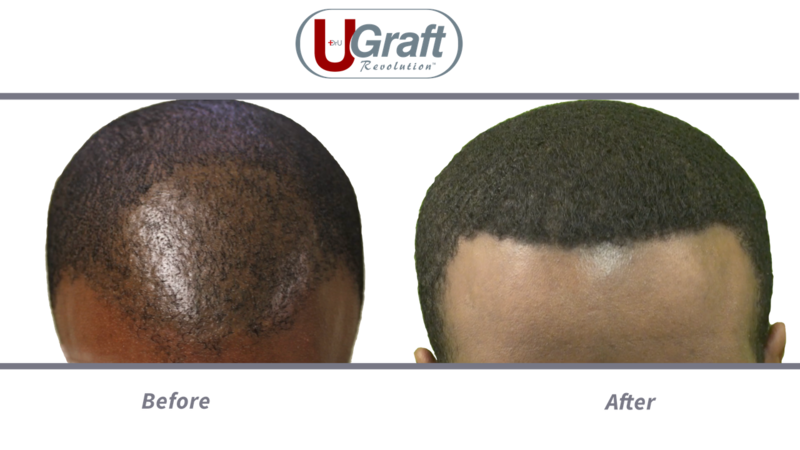 The Dr.UGraft technology represents a major forward stride in the evolution of hair transplantation for African American patients. The Dr.UPunch i™ (Intelligent Punch) and the Dr.UPunch Curl ™ have more advanced features that solve the issues of follicular shape and dermal thickness. Practitioners may include both devices in their system of surgical instruments for African American hair transplants. Some patients may benefit from the rotary Dr.UPunch i™. For surgeons who prefer more involved manual scoring action, there is the Dr.UPunch Curl ™. The Dr.UPunch i ™ is a rotary punch that is capable of accommodating stubborn afro-textured hair follicle with a flared, hybrid cutting tip. The flared end allows the device to cut away from the graft, protecting it from the sharp cutting edge. The only part of the punch that it would actually come in contact with is a dull, non-threatening surface. This hybrid design, therefore, combines the features of the sharp and dull punch into a single structure. Additionally, this device has the ability to pull the graft upward as the sharp cutting edge cuts around the surrounding tissue. With the combination of both features at work, only a shallow score is needed to completely and safely separate the follicular unit from its tissue environment. Previously, in cases where transection rates were higher than 10%, the Dr.UPunch Curl™ was recommended for use, since it’s sharp curved tip enabled a more ideal score. As a non-rotary punch, this instrument uses a plunging motion to enter the skin, followed by an upward, curled trajectory that traces around the outer curvature of the follicle. However, with the latest iteration to the Dr.UPunch i™, it is now a matter of provider choice when it comes down to selecting the right tool for afro hair transplant. The Intelligent Punch (Dr.UPunch i™) is capable of safely extracting all curly afro-textured hair, even in patients with tougher skin textures, as the sharpness of the hybrid punch efficient cuts away tissue attachments. The rotary Dr.UPunch i™ is typically used in oscillation mode to achieve this success. it was recommended that the Dr.UPunch Curl ™ is used instead since it is able to produce much lower percentages across all black patients. An African American hair loss treatment may require the use of the non-rotary Dr.UPunch Curl, particularly if the dermis and connective attachments are very thick and difficult to penetrate. The PRS Global Open featured a study which compared the use of the curved non-rotary punch to conventional sharp and dull punches. In the publication, Comparative Study of a Novel Tool for Follicular Unit Extraction for Individuals with Afro-Textured Hair, the three devices were each used on 18 patients with tightly curled Afro-textured hair. Across all eighteen subjects, the 2-pronged, curved non-rotary punch performed the best with transection rates less than 5%. In eight of the patients, the sharp and dull punches either failed completely or caused excessively high transection rates. The dull punch also outperformed the sharp punch. 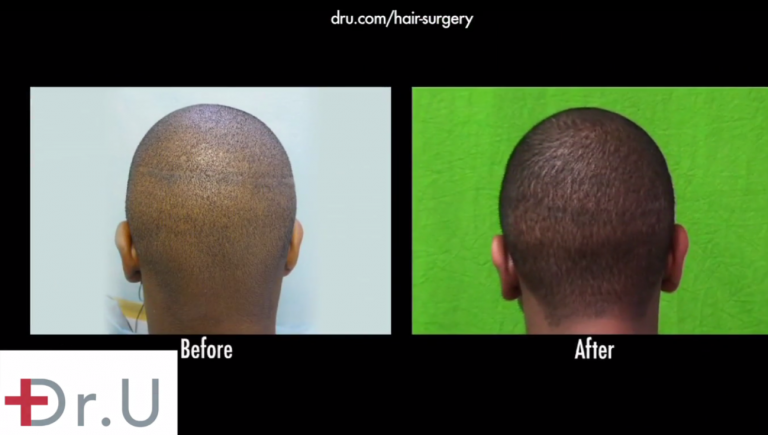 Black patients have long been considered a significant challenge for hair restoration surgeons. Although it is possible for some African Americans to attain desired growth and coverage through acceptably low transection rates, efforts to achieve such outcomes often become a hit or miss situation. 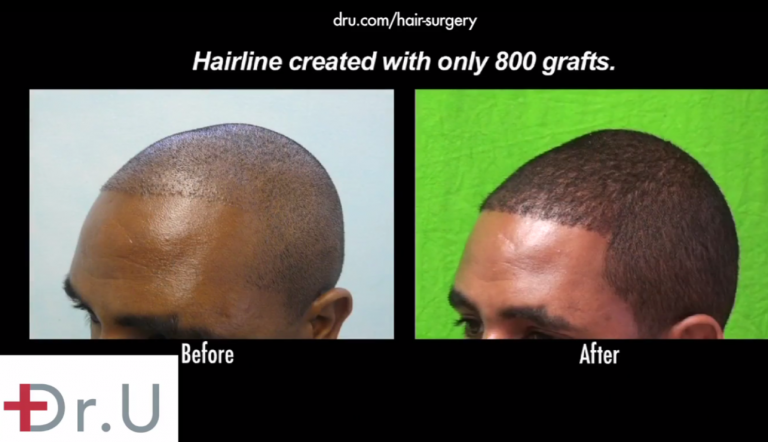 Because of Dr.UGraft suite of technologies, it is now possible for doctors to know which tools to use for any black patient to achieve the best success rates for African American hair transplants. All patients of African descent may now success with the re-vamped Dr.UPunch i™. Previously, when older versions of this rotary punch would fail to cut through thicker skin attachments, these patients would then benefit from the Dr.UPunch Curl™. A dependable surgical tool system for African American hair transplant surgeons would, therefore, consist of the Dr.UGraft rotary punch, with the double-pronged, curved non-rotary punch as an additional tool for provider preference. Up until now, patients of African origin would often have to wait across multiple tests and proceedings before they could be confirmed as candidates for hair transplant surgery. This often involved one preliminary test procedure using regular Follicular Unit Extraction (FUE) punches to extract a sample set of follicles in order to note their transection rates. Naturally, some patients would pass while others would fail. This often involved one preliminary test procedure using regular Follicular Unit Extraction (FUE) punches to extract a sample set of follicles in order to note their transection rates. Naturally, some patients would pass while others would fail. This male patient had undergone two prior surgeries before his Dr.UGraft procedure. He chose strip surgery as his first procedure in which 1000 grafts were removed. However, his results were unsatisfactory with poor, pluggy growth in the hairline and a highly noticeable strip scar on the back of his head. His second attempt at hair restoration was a conventional Follicular Unit Extraction procedure which also used 1000 donor grafts. Unfortunately, this surgery resulted in no growth. Finally, this patient opted for a Dr.UGraft procedure. A previous version of the Dr.UPunch i™ was used, which was sufficient for extracting a donor pool of 1200 total grafts. 800 were used to restore the hairline, 250 grafts applied to the crown and 150 to cover the strip scar. His desired results manifested at just 10 months following his procedure. having an extreme thickness of the skin in the dermal layerBecause of these factors, he also faced high transection percentages with the previous version of the Dr.UPunch i™. However, he was finally able to achieve successful coverage using 1400 grafts extracted with the Dr.UPunch Curl™. Photos of his outcome were taken 1 year after his hair transplant with this highly specialized technology. Determining the best success rates for african american hair transplants requires testing. This patient’s case did not benefit from regular FUE rotary punches or the Dr.UGraft rotary punch. But his successful results were finally achieved with the Dr.UPunch Curl device. This black female patient wore tight pulling hairstyles (e.g. braids, weaves, ponytails, buns) for years which exerted tension on her hair follicles and resulted in traction alopecia around the sides of her scalp. She tried to hide the problem by using other areas of hair to cover and hide the bald regions. Finally, she decided that the best solution was to choose Dr.UGraft hair transplantation. For this patient, 1000 grafts were extracted. Different regions of her head responded differently to the Dr.UPunch i™ . Some parts produced a high transection rate and required the use of the Dr. UPunch Curl ™. Other areas did well with just the Dr.UPunch i™ alone. Her desired outcome became apparent at 1 year following her procedure. To achieve the best success rates for African American hair transplants, which is the more critical factor to overcome, the shape of the hair follicle or the tissue attachments? Initially, it might seem that the curvature of the hair follicles presents the largest barrier for successful extractions with FUE punches. However, the toughness of the surrounding tissue is actually a more significant factor that leads to higher transection rates and thus damaged grafts due to the need for the surgeon to apply more force.